I love all the super adorable hand-crafted gifts the everyone gives to their friends and downline at Convention. (And many thanks for my friends who gifted me with their talent!!) When it comes to Convention gifts...I cheated a little! 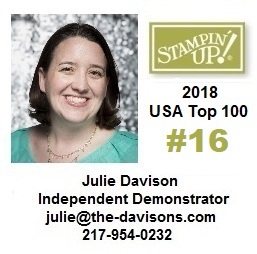 I simply did not have time for hand-made gifts, so instead, I gave stamp sets to my downline who attended Convention with me this year. I choose the Hello There hostess stamp set and stamped up a quick tag to tie on it. You can choose the Hello There stamp set for free when you host a party or place an order for $150 or more. Wow...who would not love to receive a stamp set from their up-line as a convention gift...and the darling tags...TFS!